Pug Partners of Nebraska has been blessed with several “permanent” pug residents that are considered Long-Term Foster Pugs. 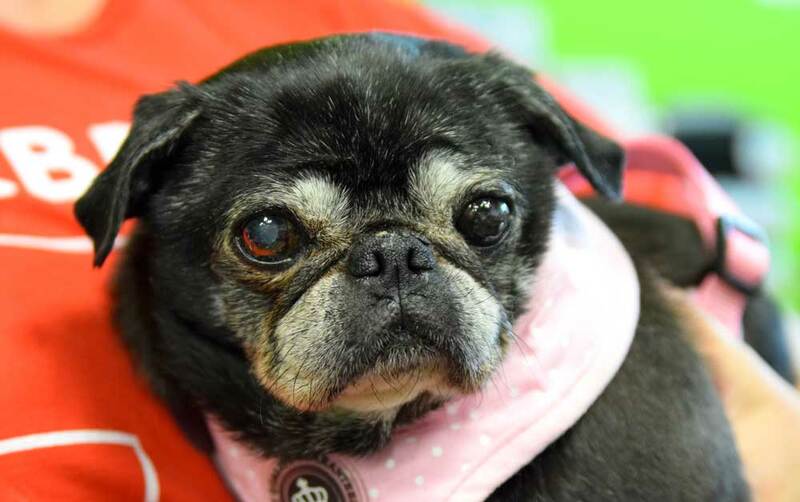 Pug Partners of Nebraska rescues many pugs each year, but sadly not all of the pugs that are rescued are deemed readily adoptable due to their age and/or their medical needs. Long-term foster pugs are just that, pugs that are deemed generally un-adoptable for one reason or another, and are placed into one of our caring foster homes to live out the rest of their years, months, or days. Pug Partners of Nebraska will continue to provide medical care to these pugs for the rest of their lives. Since the majority of the pugs with medical issues that Pug Partners does rescue get better and go on to lead long healthy happy lives, Pug Partners feels that all pugs that come into the rescue should be able to know what its like to be loved by a family. If you would like to help one of these sweet pugs, please consider sponsoring one. Our long term foster homes have to have very big hearts to be able to accept these dogs into their homes. They understand that hospice is about quality of life and not about the length of life. The pugs that are selected for this program are placed into loving, approved homes for a nominal fee and in return Pug Partners covers the medical costs for the remainder of the pug’s life. If you are interested in being a long term foster home to one of these wonderful pugs, please fill out a foster application. I'm Cookie! Do you have comfortable couch I where I could snuggle up with you?